The controversy over a trade agreement with China has engulfed Taiwanese society. Touching on political, social, generational and class fault lines, it may end up being a boon for democracy. "This movement no longer belongs to just us alone. It belongs to everybody here," declared Lin Fei-fan, one of the leaders of the "Sunflower" student movement that has occupied Taiwan's legislature to protest the still-pending trade-in-services agreement with China. Lin was speaking to a huge crowd of "black shirts" (estimated by organizers at over 500,000 and by police at 116,000) that had gathered on the streets of downtown Taipei, as well as millions of television viewers. "The people are this country's conductors. We should decide Taiwan's future by ourselves," Lin said. As Lin spoke, the crowd below broke out in applause, with some people shedding tears. With its many flowers and songs, the event took on a carnival atmosphere, but was also a peaceful, orderly, non-violent protest. And the movement, which began when student-led protesters occupied the main floor of the Legislative Yuan on March 18, has yet to come to an end. To this point, it has not only stirred up Taiwanese society, but also drawn the attention of China and the world. The controversy over the Cross-Strait Agreement on Trade in Services (CATS) has driven the political process into gridlock, divided society, and steadily sapped public trust. 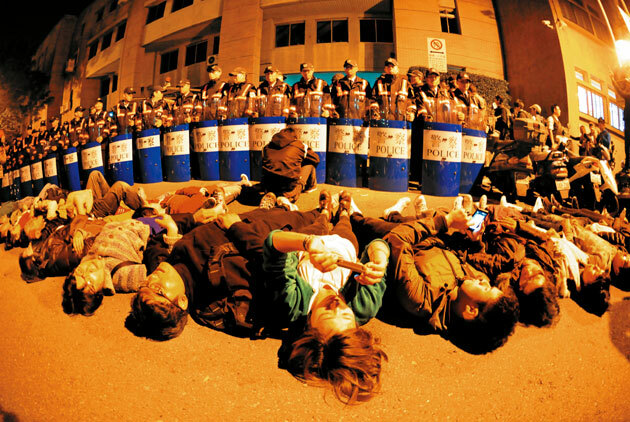 The silent majority has begun to fight back, especially after some of the student protesters tried to occupy the compound of the Executive Yuan, the government's administrative branch, on the night of March 23. "Although I agree with the students' demands, their methods are wrong. Prosecutors should hand down indictments for the public property losses incurred during the student protests, and also the use of excessive force by government agencies," says Chao Kung-hsin, a manager at Taiwan-based China Life Insurance Co. Ltd. The forces favoring and opposing the pact seem mired in confrontation like two rival armies on a battlefield with clear demarcation lines. One side argues that Taiwan's economy needs a new source of vitality, and approving the services pact will allow Taiwanese businesses to more easily compete overseas. The other side warns that the agreement will adversely affect Taiwan politically, socially and democratically and widen the rich-poor divide. These conflicts have hit home to Pegatron Corporation chairman T.H. Tung. He has represented the business community in publicly supporting the pact with China, but he also donated money privately to buy supplies for students camped out in the legislature, only to discover days later that his university-age child was among them. "Young people need to engage in self-reflection. Everybody has now heard your worries, your anger. But trying to hide and not compete with China, how are you going to be able to compete internationally in the future?" the electronics executive, whose business competed globally from day one, asked the students at the protest site. He also acknowledged the existence of generational injustice. "Adults should also engage in self-reflection. The electronics industry is competitive, but once doors are opened, will more vulnerable sectors collapse? As an economically privileged adult, I can afford to buy a home, but the younger generation is worried about becoming structurally vulnerable. Such a big movement could not have been launched by (student leaders) Lin Fei-fan or Dennis Wei alone, or have been sparked by legislative technicalities," says the executive empathetically. The controversy over the pact has stirred up a storm that no longer focuses on economics, instead touching on political, social, generational and class fault lines. The question now is, where is this all headed? Does it have the potential to be the touchstone for deepening Taiwan's democracy and civil society? Taiwan's political conflicts have traditionally been fought within the frameworks of pro-Kuomintang (KMT) blue vs. pro-Democratic Progressive Party (DPP) green or unification vs. independence. But this student movement has transcended those old boundaries. The new communication methods employed by the new generation have proved difficult for the structurally rigid government to counter. President Ma Ying-jeou's administration generally uses top-down communications and relies on traditional print and broadcast media to spread its message. In contrast, the student protesters are well-versed in social media and stress participation, interaction and immediacy. They have employed the new technology to broadcast their message to international media in real time, posting stories, for example, on CNN's citizen reporting site iReport or raising funds online to post a full-page ad in the New York Times. Confronted by these fearless students, those in power must coordinate between different views and find commonality from within their own perspectives to achieve an "overlapping consensus," a concept advocated by prominent American philosopher John Rawls. "If the government thinks that people's concerns can be dealt with simply by talking about it many times, then it has badly misjudged the situation," says Ku Chung-hwa, a sociology professor at National Chengchi University who brought his students to a spot outside the legislature for a class on democracy. "That's because communication first requires listening and understanding what the people are against. If you simply repeat things like a phone recorder, then the government and the people are traveling along lines that will never meet." So what are the values or fears held by the new generation that are being reflected by the Sunflower Movement? Taiwan has been plagued by blue-green or unification-independence disputes for years, but democracy has remained the most important consensus during that time and the value that has brought the greatest pride to the country. In this student movement, however, the young protesters have cast a vote of no confidence and taken action against what they see as Taiwan's flawed and distorted democratic system. They have lived through many major milestones in Taiwan's democratization over the past 25 years, but have come to feel disappointment in democracy, as is the case with young adults in many parts of the world. In an essay published in early March titled "What's gone wrong with democracy?" The Economist argued that one of the key factors leading to the failure of democracy in many countries has been their attempt to maintain the appearance of democracy with elections without creating the "rights and institutions that are equally important aspects of a functioning democratic system," such as the ability to supervise the government. The most successful new democracies, it said, are those avoiding "the temptation of majoritarianism – the notion that winning an election entitles the majority to do whatever it pleases." If the Sunflower Movement has cast a spotlight on anything, it is the dark side of Taiwan's representative democracy. For years, legislators across party lines have improperly lobbied government officials to get their way, negotiated bills in secret behind closed doors, used abusive language, traded fisticuffs and repeatedly seized the legislative speaker's podium to block legislative proceedings, all contributing to the body's reputation as a hall of shame and its loss of the public's trust and respect. "Public issues affecting citizens' well-being have been handled for a long time by political horse trading and backroom deals, resulting in a distortion of democracy," says Huimin Chen, an assistant professor of sociology at National Taiwan University who has taken part in the sit-in with students inside the legislature. In July 2013, lawyer Lai Chung-chiang and scholars formed a platform to "protect democracy" and began studying the content of the Cross-Strait Agreement on Trade in Services with the Black Island Youth Alliance. They tried various channels to promote opposition to the accord but received only a chilly response. What set off the more recent protests was a move by Chang Ching-chung, a lawmaker with the Kuomintang, which has a sizable majority in the legislature. Frustrated by what he saw as efforts by minority DPP lawmakers to block any debate on the agreement in committee, Chang, in his role as convener of the Internal Administration Committee on March 17, went back on a consensus to conduct a line-by-line review of the pact and unilaterally declared that it would be sent to the full floor for a vote, one the KMT majority was almost sure to win. This breach of basic procedure caused an uproar. "At the beginning, some NGOs held a 120-hour 'Safeguard Taiwan' event, but after the Chang Ching-chung incident, students felt that more action was needed," the student leader Lin Fei-fan explains. The dysfunction of party politics and the downward spiral of Taiwan's democracy into absurdist drama have not only spurred the birth of the student movement but also helped it receive widespread support from the public. Many of the parents supporting their children's participation in the Sunflower Movement are middle class and believe that a democratic system is the source of hope and change. "This is a protest of Generation Y, which believes in democracy, versus Generation X, which believes in economics. Taiwan's future is full of hope because it can break through the vicious cycle," says the CEO of one leading Internet technology company, who suggests that society should take advantage of this opportunity to build a new democratic order. The opposition to the services agreement also reflects a deep-seated mistrust of China, the government's effectiveness and ability to execute policy, and free trade. The protesters have different perspectives on whether or not China is the most important economic market than the government or entrepreneurs. Since President Ma Ying-jeou took office in May 2008, he has moved aggressively to improve relations with China, and he sees the trade-in-services pact as a significant milestone in advancing those bilateral ties. In his New Year's Day address, Ma declared that 2014 would be a key year in strengthening the economy. He expressed concerns, however, that Taiwan would be marginalized by the trend toward globalization. The trade strategy roadmap he proposed for the coming year was to ratify the services pact with China and accelerate Taiwan's bid to join two regional trade blocs still under negotiation – the Trans-Pacific Partnership and the Regional Comprehensive Economic Partnership. Faced with strong opposition to the services agreement with China, he is reported to have said, "There were no problems with signing trade pacts with Singapore and New Zealand. Why is there suddenly a problem with the services pact? Why is there opposition to anything involving China?" When the president meets with foreign visitors, one of the achievements he often brings up is improving cross-strait relations. In an interview with The Economist in late March, Ma reeled off several figures showing increased cross-strait economic activity: "a tenfold increase in six years in mainland tourists to Taiwan, to 2.85 million in 2013; cross-strait flights from none at all to 118 every day; two-way trade, including with Hong Kong, up to $160 billion a year." But the numbers have failed to dissipate the suspicions of China harbored by many Taiwanese. "Facing an undemocratic government, any time Taiwan signs an agreement with the other side of the Taiwan Strait, there should be a monitoring and evaluation mechanism," says Hung Chen-ling, the director of National Taiwan University's Graduate Institute of Journalism. Democracy, she says, demands open and transparent information that enables the people to make accurate judgments and choices. Lin Hui-lin, an economics professor and the director of the College of Social Sciences at National Taiwan University who has warned of the perils of the pact in many interviews since it was signed, acknowledges that open competition can help improve efficiency, but because relations between Taiwan and China remain sensitive, there are other considerations at play. "If you only focus on the economic benefits but harm national security and the country's sovereignty in the process, then the negatives outweigh the positives," she says. The considerable unease and skepticism reflected in the protests and general opposition to the pact also result from a lack of trust in the government's strategy to fully liberalize the country's economy. In pressing its case for joining free trade blocs, the Ma administration has overlooked the fears of students. "We are opposed not only to the services pact but on a broader level to freer trade in general," says Chou Fu-i, one of the members of the Black Island Alliance and a Ph.D. candidate in history at National Taiwan University. The alliance has clearly asserted during the recent disturbances that they are worried that liberalization and free markets would only benefit big capital. The group believes that the trade-in-services agreement involves the issue of class, pitting a small group of big conglomerates able to expand overseas without any constraints against Taiwan's small farmers, workers and businesses, and threatens the future survival of the younger generation. The challenge of survival has touched the most sensitive nerves of young Taiwanese. "I quickly handed in a slip asking for a day off and ran up to Taipei," says a National Pingtung University of Education student nicknamed "Mantou." The only reason given for the absence was "a family issue." "My father is a baker and my younger brother is a plumber/electrician" Mantou says. "Of course the trade pact is my family's business!" Not only will the agreement impact workers, but the soon-to-graduate "Mantou" also personally feels anxiety about entering a job market plagued by high unemployment and low starting salaries. NTU economics professor Lin Hui-lin believes that a precondition for opening one's market is fair competition, but the difference in scale between the economies of China and Taiwan threatens that balance, and it's also possible that China could use its economic brawn to engage in monopolistic practices and operate outside market mechanisms. Because of that, the content of any agreement with China must especially undergo a thorough evaluation of which sectors would gain and which would be left vulnerable. Once a full accounting is obtained, supplementary measures need to be drawn up, Lin says. "All of these things must be assessed beforehand, rather than signing the agreement and then handing it down to subordinates to conduct a review," says Lin, who insists she supports opening up the economy but feels that guidelines and complementary measures are necessary to make such an initiative work. Many companies investing in Taiwan have gradually come to realize that no matter which party is in power, if the government cannot find a way to converse with civil society, their projects will amount to nothing, leaving the economy nowhere to go but backwards. Popular opposition has shut down the Kuokuang Petrochemical project, a real estate development in Dapu in Miaoli County, and the fourth stage of the Central Taiwan Science Park. This shows how much Taiwan has become a society in which civil movements set the social agenda. The movements are spearheaded by professors providing theoretical rationale for action and young people taking the offensive on the front lines, with the support of many people in society and the media, all coalescing around specific values rather than partisan political lines. At their core, protest movements take on the establishment, often employing more advanced international standards and universal values. The key is how the country's executive and legislative arms respond to the appeals made and reconcile policies appropriate for Taiwan's needs. Prominent historian Yu Ying-shih described the Sunflower Movement as "a movement elevating Taiwan's democratic system." Through this initiative, the people have consolidated their civil rights, and the government can enhance the caliber of the country's democracy by listening to the people's voices. Though Taiwan faces a difficult predicament in the international arena and severe economic challenges, "democracy is the greatest guarantee of Taiwan's security," Yu argues. The emergence of the Sunflower Movement has exposed several deep-seated issues – the dysfunction of Taiwan's representative politics, distrust of China, and anxiety over globalization. But Taiwan's future cannot consist solely of protest movements, and with resistance to the trade-in-services pact now in its third week, the time has come to find a solution.